Two books, two points of view. 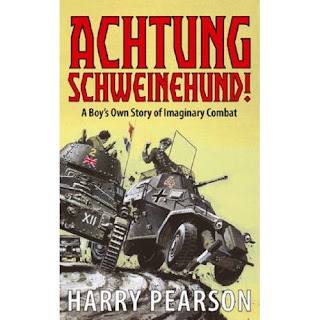 So I hope we all had an excellent Xmas; in the run up to the arbitarilly assigned date of significance I found myself reading 'Achtung Scweinehund', by Harry Pearson. An excellent little book. 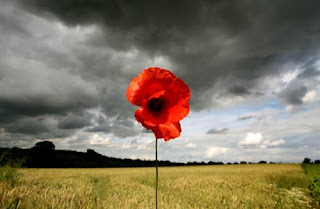 Harry like so many of us, grew up in an England not so much haunted by the Second world War, as infused with it; and the influence it has had on his later life is a large part of the subject matter of this book. He manages to warmly recollect his childhood with toy soldiers, the hopeless Action Man and the interminable Colditz boardgame; whilst Uncles told him about how many 'Japs' they'd killed in the war. At the same time he does a good job of introducing wargaming as a subject for the uninformed, and of providing a basic history of it's genesis in Europe (particualarly from around 1600 onwards) and the early manufacturers of the figures with whom he is most interested. Also, and importantly, Harry addresses the emotional issues related to wargaming, and more generally that certain breed of men who seem to enjoy them most. Towards the end of the book he considers the issues of Nerds, and the many breeds of gamer. How some of them seem never to grow up, whilst others drift away from their hobbies as some sort of social expectation makes them believe the time or money invested is not worthwhile. For Harry himself, he is proud to admit he is a Geek, and by the end of the book has reconciled the position. The distinctions between Pearson's book and another I read earlier in the year, could not be more distinct. Whereas 'Achtung' celebrates a hobby, 'The Elfish Gene' reads like an embarrasing condemnation of one, with the 20/20 vision of hindsight in very tight focus. As a roleplayer in my youth, I can identify with an awful lot of the experience Mark Barrowcliffe writes about in his book, just as I could with Harry Pearson. However, whilst Mark's book is on face value much funnier, you rapidly come to realise that this is because he is deeply ashamed of his involvement with the hobby. The guy is painfully aware of how uncool he feels his hobby made him, and blames in large part the hobby for making him that way, rather than the tendency of all boys to be like that. As a result, there is a denialist streak running through 'Elfish', as if the author is very definately saying 'what I did was wrong, and I know now that it was wrong; please forgive me and don't do what I did.' He paints the characters who were involved in gaming as almost uniformly dysfunctional in some way, and potrays his ability to talk to girls as a sign of his superiority over them, and gateway to final freedom from geekdom. Frankly this is kind of annoying, and what is worse is that Mark simply chooses to attack his target, as it would be seen as an easy one to do so with. I can't imagine a similar version being written about Football or Fishing for example. 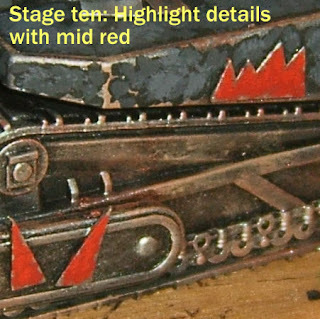 For all of that, it is a humourous red, but unlike 'Achtung Schweinehund, it leaves a bad taste in the mouth. For a nostalgic and ultimately nourishing read, use your Xmas book token on Harry Pearsons work; then lend it to friends or family who don't get why you like toy soldiers. 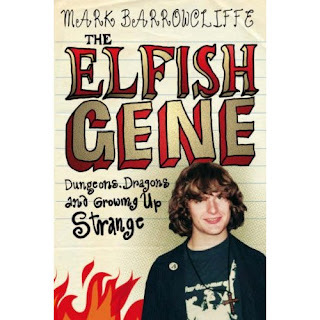 Borrow the elfish Gene from the Library, by all means; but don't attempt to explain yourself to anyone with it! Well, the mountains are being the fickle mistress they usually are, in the last two weeks they've given me pleasure and frustration in equal measures; and so far they've cost me a music player, a jacket and a very badly damaged board. The net upshot of all this is that I made time to do some painting yesterday 'for relaxation'. Some may argue all I do is relax out here, but the sort of mental cool-down that painting provides me isn't accesible up here by any other means I know of (beer included!). 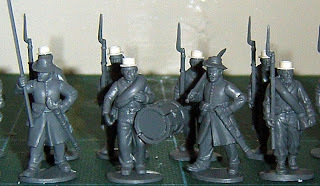 Anyway, there's not much to report so far, I managed to undercoat a unit of Union troops in about an hour. The working arrangements for this being even less solubrious than my old operation: sitting on a blanket on the floor of my tiny room, with a small painting board couched in my lap and a box with all my paints and modelling bits beside me. Still it was a refreshing break to do something so simple. Next up, some colour, and photo's to boot! 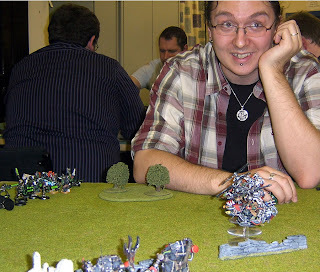 Before heading back over to France I was able to pop in to my old club in Grimsby, home to several bloggers well known, or otherwise, to my readers, and where I spent the first fifteen years of my wargaming time. Many familiar faces were in which was pleasing, and moreover a selection of games were going on, giving me both plenty to talk about (catching up on as much banter and such as the actual games) and photograph. 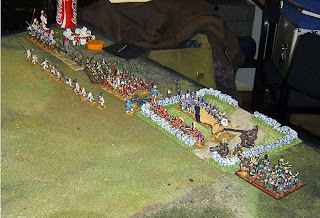 Another game on was a 15mm 18th century game. I can't really say much more about the details, it could be historical forces or hypothetical ones, but the game seemed based on a scenario in the BattleGames magazine (which I must admit, I saw for the first time on this visit; it seems like a good read, I may have to see if I can buy some back issues on the net...). However the centrepiece of the evening was a World War One game being staged downstairs on an eight by ten foot layout in glorious 28mm. 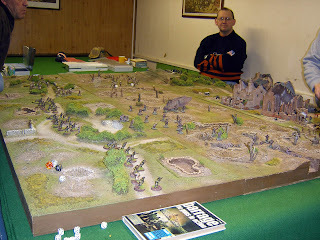 The game featured Paul Robinson (AKA Grimsby Wargamer), Mark Alcock, and others playing over the fantastic terrain created by Mal Taylor (a master of the art). 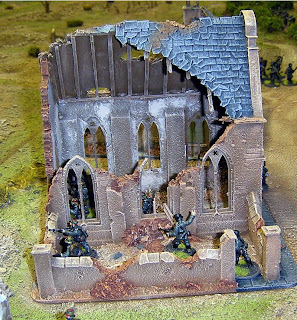 Look at this spectacular ruined church! Mal's attention to detail is remarkable many of the buildings are interchangable on modualar bases that blend in to the table, and can be replaced with trenches too. Mal was always notorious for looking at other peoples work on his terrain board and going "well, it's good, but it's not what I had in mind." A perfectionist doing his best work. This one was definately it for me. 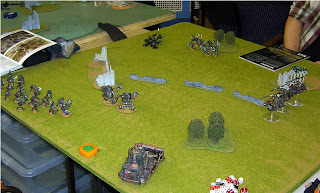 On my last visit to the Night Owls, myself and regular, Ross, had a 1000pt game of 40k. 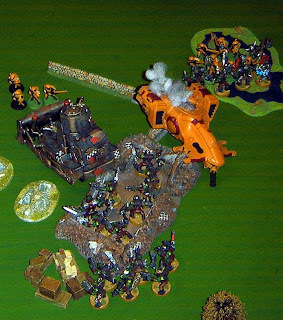 The scenario ended up as kill points with the Dawn of War set up. 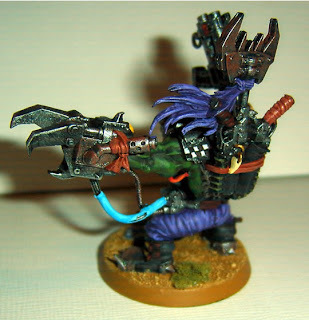 the forces were my Orks against his Necrons, an army I'd never faced before. Ross began with his lord and two units of Warriors, Nothing sensational but good stand off and shoot troops. And stand and shoot they did, from the very back of the table, but as I'd been allowed to deploy first and per the rules I was only 18 inches away from him and moving first could sacrifice shooting to close distance quickly. The one round of shooting my lads endured killed a few Boyz but couldn't stop the Nobz. To Ross' horror we called a big Waagh and got into close assault on turn two, wiping out one unit and leaving the other locked in combat, one they would ultimately win; but by now my reserves were arriving - en masse. 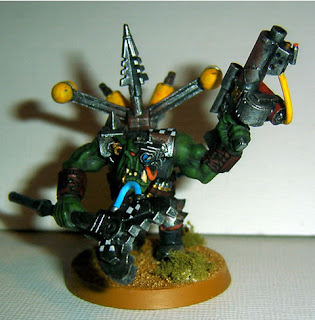 With Tanks, Killer Kans, Deffcopters and more Boyz led by the Warboss on the way, Ross could sense disaster, he came very close to conceeding on turn two. He managed to hold the line a little longer and another of his units (IIRC, Immortals) arrived. Sadly just in time to take a hit from the Nobz. Although it was a close fight, the Orks won, and for the second time in the game a terrible morale roll for the Necrons saw them try to flee from the fight, get caught on a poor initiative roll and be wiped out. This time when Ross' hand was offered I shook it, as there was no need to prolong his agony any further. And so that was that. I think it is fair to say the scenario gave me the edge in this one unwittingly, the Necron firepower could have easily done for the Orks, but in the event it came down to controlling the close assault phase once again. 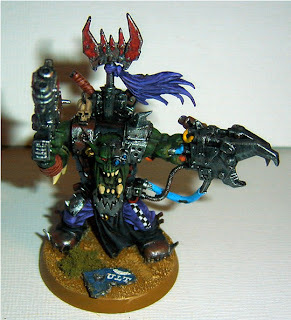 I'm putting the Orks to bed now of course, so when I get back to playing games the heady days of their constant victories will be far behind me! So, some of the last painting of the season for me. Pretty much the last actually. I must set to packing up the painting kit now. 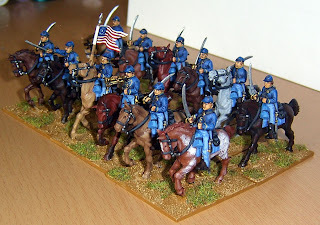 I managed however to get a fair bit of time, which was needed, in to finishing the first unit for my Federals; the VI Corps cavalry – 1st New York. 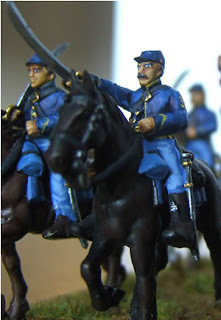 It is my experience that the average cavalry figure takes three to four times as long as an infantryman to do properly, and these guys were no exception. 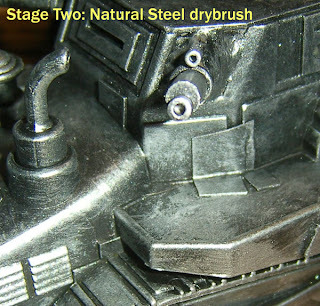 The Perry figures are finely detailed, but that of course means more to paint and thus it slows down the making. Still the cavalry were the obvious choice to do first, I had some good reference to hand to start on them, and they were able to serve as a useful stand-alone unit to test uniform colours on. As it happens two paints I already had were ideal for the basic uniform. Flat Blue (70962) proved perfect for the trousers whilst Dark Prussia Blue (70899) suitable for the coat. Both of course needed highlighting up, but as standard uniform basics I’m pretty happy with them. I’m also fairly happy with the horses, though they took the bulk of the painting, what with the three to four layers of highlighting applied. I’m not at all happy with the flesh tones, though at a distance they do look OK. Something went wrong when I highlighted over the wash, I think the reverse would make more sense in future. 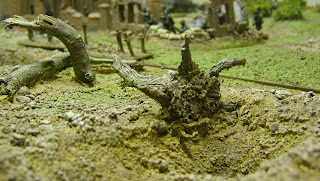 For the basing I mixed together summer and autumn grass mixes, with a handful of turf, which gave a fairly natural look. So anyway, that’s them done, though who knows when I’ll get round to any infantry to back them up! So we never made a 2:1 ratio in the end, as buying got kinda out of control. But I did manage more than I bought, which is at least assuring. And selling over a hundred mini's (all to the same regular customer, as it happens) certainly helped fill the bank balance (to the sum of around £150!). Overall I'll have to take that as satisfactory. Dogs of Win? Surely not! Challenged as I was to a Warhammer battle by a very young upstart at the NightOwls club, I responded in the only way I know how, by bringing what I thought to be the least competitive army I possibly could to the table. Why? You may ask. Well some would know for sure. Lose to a kid playing your best and you have no real excuse at all, lose with your worst and you can at least decry the army instead! A lot of offensive ability if managed right. So what to do. Well the terrain set up suited me, despite the randomised movement of some of the items. I won the toss for edge choice and went for the open side, meaning I could base my defence around the stone walled field, whilst any attack he made would be slowed down crossing the ruins and woods. Here I guess was were his lack of experience played in my favour. We alternated units for deployment, and I stuck to my plan in the centre, trying to hide my increasing amazement at his own deployment. Even if you don’t know Warhammer you can understand the questionable logic of sticking essentially half your army on a flank behind cover where it’s commander can have no influence on it. 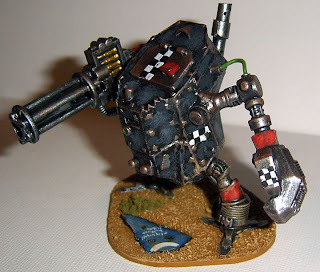 The Bolt thrower was placed early, allowing me to avoid what is pound for pound one of the cheapest and best killers of ranked units in the game. 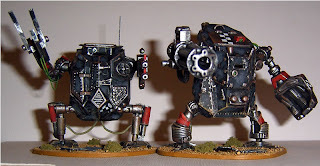 Conversely he put the rest of his shooting in a mass block, reducing it to no battlefield use other than as a Fanatic transporter. Anyway. All this did rather play into my hands, allowing me to not so much refuse a flank, as an entire half of the battlefield. The initial couple of moves went well for me too. Unsurprisingly the troops on his right were of no value, so at the minute I was fighting a smaller effective force, I was able to spell and cannonade the goblins into a rout before the did any harm; taking a panicking chariot with them. The other chariot was lured into a fight it couldn’t win with my knights. Bizarrely he targeted a cannon crew, obviously he saw these as a big threat. It was a one sided fight to be honest, as I didn’t get to roll a dice; the crew was wiped out, but that then sparked panic in the army. Whether he intended it or not, his choice of target looked pretty smart now. I didn’t fail many panic tests, but one that did was terrible, the Paymaster and his bodyguard broke. They were also protecting the General, and right at the back, they were off! The rest of the army needed to test now, but thankfully passed, still, Azhag had cost me 500 points or more, and evened things up. Thankfully he pursued off the table; giving me a respite. I took the opportunity to advance my lines, and luckily rallied my other panicking unit. Looking at what was left I thought I could defeat him in detail, and hopefully Azhag would have not army left to command. The Ogres charged the Black Orcs, but despite killing several, lost out on resolution and were run down, the Dwarfs behind them bore the brunt next, whilst the wolf riders charged the Pike. It was looking bleak now as Azhag returned. The Dwarfs broke, but the Wolf riders broke too, and the Orcs pursued to a point where their flank was wide open to my knights. 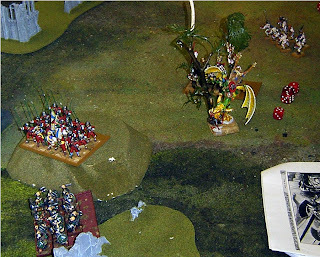 This time an unforced error from Azhag saw him try to charge my Captain on his winged lion, who was easily out of range. Azhag wasted another turn. The Knights wiped out one Orc unit, and the Pike hammered the other, The Dwarfs on my left contained the giant, who then along with the trolls went into a panic at the retreating Orcs. The Knights and Duellists attacked Azhag, and finally killed him, leaving only the Wyvern left. I have to conclude that I was in some respects gifted the opportunity to win. The plan of my opponent revolved only around Azhag and his novelty troops, which he squandered through poor deployment and unsupported attacks. Azhag himself was a terrible threat, but one I was able to contain with about a third of my force leaving the other two thirds to deal with a poorly coordinated enemy. I was chuffed with the win, and can only hope the kid learned a couple of tactical lessons! Stop Press - Plastics again! "At Warlord Games we’ve always said that we will would tackle new periods that have a strong flavour for gamers all around the world. In all sorts of surveys and polls that we have seen the English Civil Wars and the Thirty Years War have been right up there on people’s wish list, and that’s certainly the case with us too!" 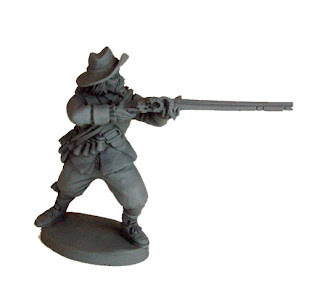 So, another period appears in 28mm plastic, with Warlord Games announcing three sets of English Civil War figures - Royalists, Parliament and Scots. I'll not be tempted to scale up on these, as my 15mm ECW armies are virtually finished and have plenty of opponents. Still these look mighty nice, and could fill in for Thirty Years wars or in my case another unit of Dogs of war pikemen. Truly Plastics are coming of age now, I doubt there'll be many periods not covered in some way in a few years time. I grabbed a couple of 500 point Combat Patrol games against Chris the other week, a last hurrah at one of the Leeds Clubs before going away. My Orks were in no mood to mess in both games, proving that in this size engagement they rule the roost. The first battle versus the Tau, could’ve been won by Chris with a less enthusiastic advance at the start, he should’ve used range to defeat me. In the second game I was worried by a mass of Tyranids; Chris was worried by the Big Mek with a Kustom Force Field, and so killed him in short order. 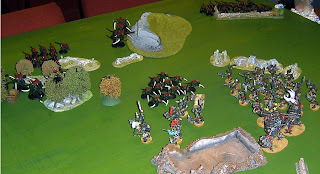 I however went straight for his command Warriors, and after dealing with them the rest of the army crumbled. I don’t want to brag, but generally I have been on a roll with this army, and games in general of late. So this was the icing on the cake. CD covers may be the right size for a smoke screen, but it is just WRONG! OK?! 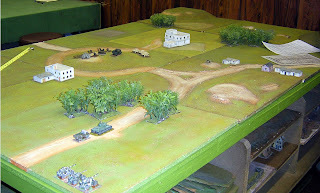 Elsewhere in the club, there was a large 10mm WW2 game going on, using the Blitzkrieg Commander rules. 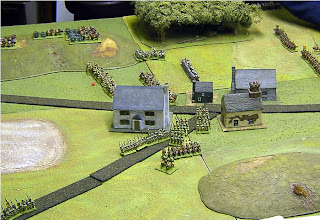 And a Fields of Glory game in 15mm. These look like a reasonable descendant of DBM, at least the units look like actual formations of men. Still I’ve yet to try them myself, and cautions about reviews of them being messy to read and play, keep me from really trying them. Well the first activity on this project has begun. The first point was obviously to decide which side to plump for. Of course, there is always the possibility I'll end up doing both, but one has to start somewhere. The Confederates are of course where all the romance is, where the uniforms are most interesting and varied, and are also the underdogs in many respects. However, they were quite obviously pro-slavery, something I find rather nasty in such a recent 'civilised' era. So I went with my long standing principles and opted for the Union, even though, as history buffs will attest, many of them were keen to stress how little the war had to do with slavery at all! Yes, it was an issue for Lincoln, but McClellan, sometime general in chief of the Union armies, for example, thought it irrelevant. Anyway, that out the way, I wanted to field some historical units. Based on some early reading of one of the Osprey Campaign series, I selected a sixth Corps command, IIRC the Division of General Franklin to begin with. Bear in mind I don't have my notes to hand as I write this! Beneath this is Bartlett's Brigade, which will be my starting point; with four regiments of infantry. Based on the contents of the boxes of figures I had, and the chosen rules of my local club(s), I opted for a regiment being 18 figures strong. That way I can field all four with no additional outlay. The contents of the boxes make for two units marching and two firing. Assembly was next, and being plastic figures this is easy enough, but slow. Removing mould lines and gluing on Kepi's. I personally decided that the perry figures looked weird with the kepi simply sat on the figures as moulded, it sat too high on the head; the solution was to cut the top of every head off, and trim the edges to get it to sit flush. Doing this over 60 times slowed the process even more but aesthetically it looks much improved. 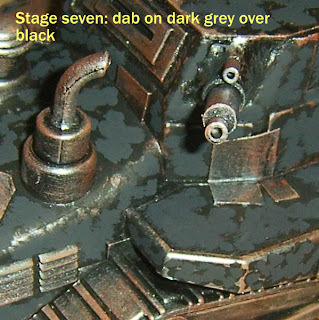 The handful of other parts to add were a breeze, especially the firing poses, which are perfectly created. The conversion potential of the models is, to be honest, limited, and there are the obvious compromises of them being generic, many ardent historians believe the Union troops never rolled blankets over their shoulders for example. Still I did start to tinker a little, such as the standard bearer here; having a sword hilt added and his head reposed. One of the units under Bartlett was the 16th New York, who were notable for wearing straw boater hats instead of Kepis. I chose this brigade on the strength of the variety that might add to the models (though as it turned out the formations saw plenty of service too). I got a little manufacturing process together and turned out 16 little hats, the officers keep their regulation attire. The tops have been filled by the way. Having since found a photo of men of the 16th online, I now find that the hats they wore had a much wider rim though! So not at all like the 'Buster Keaton' styled boaters I opted for. Am I enough of a perfectionist to redo the rims; I fear I may be. Still a long weekends effort saw the four units assembled and bagged up ready for painting; the next task for them is to get a window of opportunity in the next week to spray undercoat them all. However in the meantime the Corps Cavalry is already started. Undercoated with Humbrol acrylic (good for this as it doesn't bub off, no good for anything else as the coverage is dismal), and a start made on the horses. I find cavalry tiresome to paint, so I'm glad this is the only unit I need of them. So anyway, I'm off to a good start. 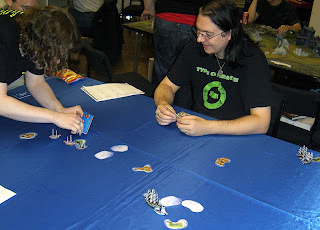 The recent theme of board games was strong again in the club for me and this last Sunday I also took along my Pirates cards, occupying as they do a middle ground between a conventional wargame and a boardgame. We rattled through a couple of games in under a hour each, fairly standard fare, but it introduced two guys to the system, and as is so often the case, caused a number of people to wander up and declare they had a pile of these in a box under the bed somewhere at home. Of course I failed to win either game, in the first two-hander I was sunk in close action whilst trying to make off with the enemy's ships. In the second game three of us fought over the islands. On reflection, this is possibly the weakest way to play the game, as it conveniently divides up the basic layout to 'one home island and one wild island' each. The treasure placement means most of the time the island nearest a player will have their best treasures and the opponents worst treasures. Players will ferry their treasure home unassailed, and the game will turn on the luck of who had the best hand of second-choice treasures dealt to them. In this game fast ships will always win, and indeed the ability of one player to nick a couple of bits of treasure off my island won it; although knowing I was going to lose, I made merry hell with a massive five-sailed ship, blasting everything out the water foolish enough to get in my way. Next time I think we'll go for a 'fleet action' and start with the treasure on our vessels instead. 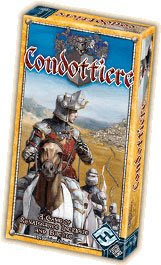 After this we played Condottiere, essentially a card game with a board for recording the results of hands. The idea is each player represents an Italian prince and uses his hand to try and gain control of territories. It's a game of bluff in essence, and I did appallingly at it, not coming close to winning either time. We squeezed in a game of Dominion next, before moving on to Battlelore. 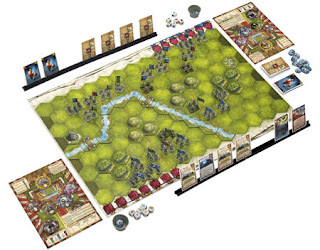 Battlelore is essentially a hex based wargame, with simple unit representation and a command and control system based on the use of cards to activate units in one or more of the three sectors of the battlefield. 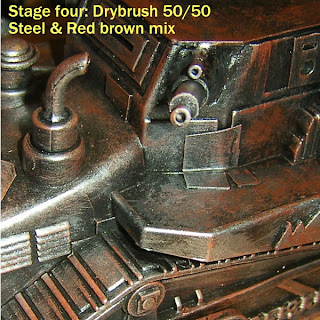 It's the sort of game that will certainly appeal to people who like the idea of wargaming, but not the investment in time involved in painting figures, making terrain and so forth. I found it a little simplistic, but competent enough, and the little figures (approximately 18mm scale, or 'true' 20mm - 1/87th) are nicely made and begging for a paint job. 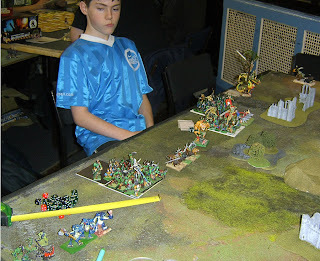 The rules covered both historical and fantasy games, and provided figures for both - Humans, Goblins and Dwarves; which I could only approve of, though if you are not well versed on your medieval history already, you are only likely to recognise one battle. As it was we 'proved' that the English couldn't win Agincourt; twice!, before 'refighting' a thirteenth century battle from of succession in Brittany. The historicity of the result will remain in doubt, though clearly in the Agincourt scenario, the designers had opted for game balance over reenactment. All in all another entertaining waste of a day! For the time being at least I have no reason to add anything more to these two armies. So with the finishing of the figures below I am happy to declare them both finished. First up are a unit I'd not planned on, but opportunity offered to me. I picked up a group of Halberdier figures at Fiasco last month, and was able to turn them into the Bodyguard for my Paymaster in the Dogs of War army. 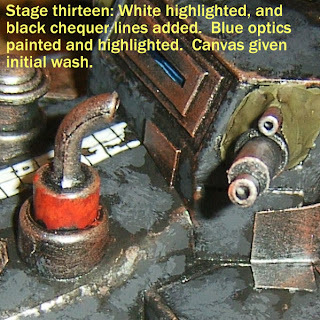 Very little outlay either in money, or effort as these were very simple figures to paint. The camera is packing up it seems, these pictures are very poor, and in truth the colour of the uniform is a more regal purple. 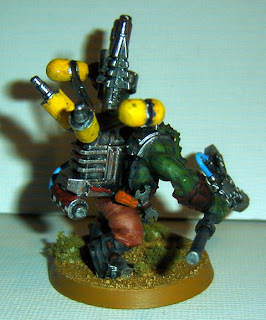 Elsewhere I was able to buzz through the finishing touches on this Ork Warboss and Bigmek. Although notionally Goffs, who wear a lot of black, you wouldn't know it after the effect of painting all those wires and wotnots! Again the camera is doing a good job of letting the side down, plus natural daylight is at a bit of a shortage for camera work. I'm not as enamoured of this figure as many others seem to be, I find the pose a little awkward, and other than the clip on arm rather flat. Still I'm glad to have got these out of the way. I'm now moving on to the last little project before I pack up for a bit. They think of firelit homes, clean beds, and wives. In an effort to keep ahead of my self in the painting stakes, I fell back on the old faithful, World War Two Germans. Easy to do and always a good seller on eBay. 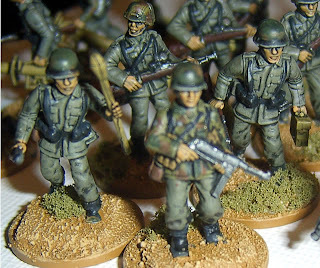 A Battalion sized group based up for the Rapid fire Wargames rules. Mostly based on pennies. 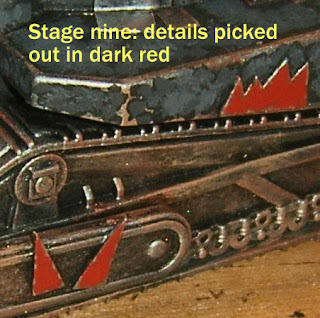 The unit designation was picked up from one of the recent Osprey books on the Wehrmacht. 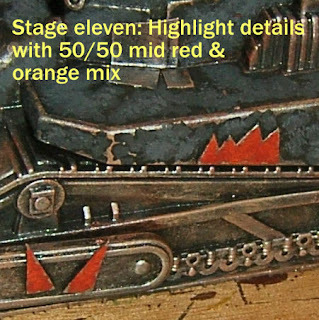 Unit painted in M1943 pattern uniform with custom made camouflage jackets and helmet covers on about 10% of the troops. The colours are I must admit much greener than the traditional German uniforms I'd still been painting until recently, but it just shows how different fact is from perception (and historical stereotypes I guess). 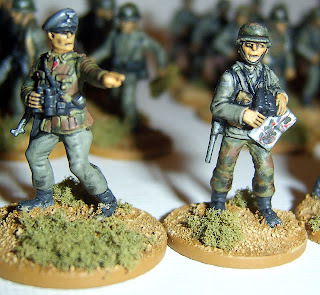 20mm scale figures by Valiant Miniatures £9 for 68 hard plastic models. 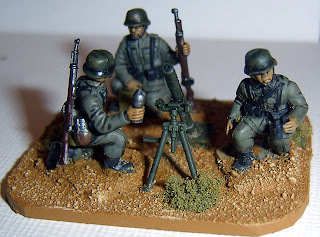 Including heavy support such as this 80mm mortar team. Below some of the regular infantry. I probably should have dealt with that flash! It's only obvious on a couple of pieces, but that Panzerfaust is really bad looking. At first there was a lot more black in the mix and I had to scrap the blend and start again as it was far too dark. The glazing agent slowed the drying process down but made for good pooling of the shading black. However, it is not at all hard wearing! I had to revarnish the helmets to protect the most handled surfaces from apparent wearing. The Leeds NightOwls have a steady attendance of boardgamers, however until recently I'd not got involved in any games of such. Although I enjoy boardgaming, and have a selection myself in storage, they always play second fiddle to moving figures around. 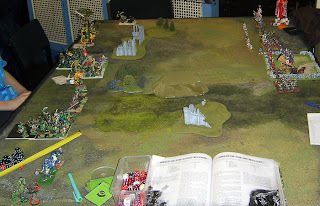 However when you are burned out on being cheesed to defeat/cheesing victory every week in Warhammer, and can't seem to get a game of 'proper historicals' going, the opportunity to play a game where the rules are the same every time and for all-comers is appealing. 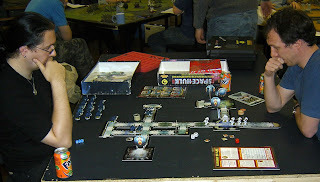 First up for me was Space Hulk, a game I played once about 15 years ago, but fondly remembered. To say it is a blatant rip-off of certain science fiction films is somewhat baside the point; in a simple game engine it rather brilliantly captures the tension of said film, and with its' map styled board has potentially infinite variety to otherwise simple game play. I played The marines (neither of those guys are me by the way, wisely, I'm behind the camera), attempting to reach a room in need of a serious burning. As was the nature of the game, this all went very well until the first casualty. Thereafter the managing of troops becomes increasingly difficult; until it reaches a point of impossibility. 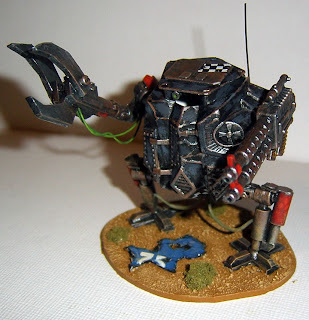 Winning as the Marines seems to be very hard, despite the fact that they pack vastly more firepower than the attacking Aliens, erm Genestealers. Overall, Space Hulk falls into the category of 'Simulation' for me, in this case a skirmish/tactical military sim. The other game I've played, and really enjoyed, recently is at the opposite end of the spectrum, being pretty much completely abstract. 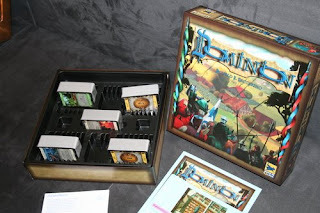 Dominion, is played solely with a deck of cards, no dice, no board, no counters. In some respects it is like a Collectible Card Game, though the set itself comprises all the cards available, and there is no requirement to buy other items. Each player represents a petty lord aiming to create the largest kingdom, and this is expressed through the accumulation of a deck of cards. Each player begins with ten identical cards from which a hand of five is drawn, these comprise money and lands, lands equal victory points, but play no part in the active game, other than clogging up your deck. However to buy land you need money, with which you can also invest in buildings, communities, warriors, events or characters. In game ten different types of 'action' cards are available to buy and these influence what you may be able to do in a turn. You start a turn with an action card - so you may play the village, which allows you another card and two more actions, you might then play the witch - another action card that attacks other players. Then having, used your action cards you may use the cash in your hand to buy new items, with 4 money you might want to get a workshop for example. You then draw a new hand of five cards, and reshuffle all your other cards, including the ones you played and your old hand. It is really, beautifully simple. The play takes the form of an acquisition race therefore, whilst some cards will hold up you opponents, the main aim is to rush forward your own strategy. Any given hand is random and essentially dictates it's own play order, but the subtlety comes in how you use you resources to load your deck. At first you will concentrate on action cards, then money and finally lands. The game ends when three piles are expended (out of the sixteen in play). The other beauty of this is that you can only guess who is winning, based on what you recall them buying, stealing or otherwise. When the game ends the values of lands and limited other special cards are totted up, highest result is the biggest dominion. It's a totally abstract game, but in the two games of it I played, we were quickly into the character of our preferred tactics, and the sense of rivalry was amiable, but genuine. It's a game simple enough for kids to learn, but clever enough to reward multiple plays. Also the cards themselves are attractive, and of high quality, but you'll soon want a nice soft surface to play on. All in all though, very enjoyable. In the next couple of weeks it may be more boardgames as the figures go back to storage, so it's nice to know a few good ones are around. 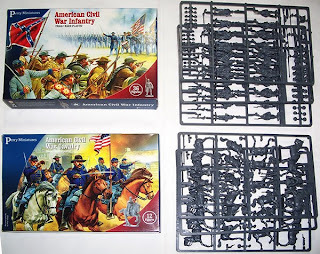 I find that I've been rather disparaging about the American Civil War in the past in my blog, and yet despite declarations of it not interesting me; I find myself having bought three boxes of the Perry Plastics. I think it's time for some humble pie, or at least revisionist history. NO! No, no. I can't lie like that; a swift 180 this is not, but I have had to reconsider in some small way my reasoning's for a disinterest. On face value, I bought the figures for something to do on those nights over my winter in the Alps, where I'm too burnt out to go to the pub. The intention is to strip them from their sprues, throw em in a box with the paints needed and take just a minimum of material to allow me to work on them. It may only be once every couple of weeks, so I didn't want to take a big project; a mistake I made last year. I looked at the Perry Napoleonics, but got the fear over entering such a huge topic, this was a score in favour of ACW, it had a much more clear-cut history, one I could get to grips with fairly easily. Secondly the Perry Naps were, French; In a rare streak of patriotism, I wanted to start there with the British, if anything at all. Next there was the issue of uniforms. Napoleonics are complex to say the least, and it seems, it is critical to get the details right, lest the button counters come and get you. With the ACW forces, the uniforms were more basic, and often not particularly regular. Another score for them. Finally price, who doesn't like a bargain? I managed to pick up two pack, one of each, for £20, and added another for £12. 72 foot and 12 horse for £32 is great value in 28mm. Sold. But now I have to make myself learn about this war, at least enough to get the painting basically right. To that end I've read a couple of short books on the topic so far, one of the Osprey Essential Histories series and A Europa Militaire uniform guide. Actually, as a reader of history, it is no less interesting than any other war. 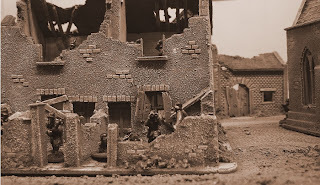 And although it has it's huge set pieces, that seem to be the point of interest for many wargamers, there are plenty of smaller actions, that are well recorded that seem more fascinating to me, and more reasonable to reproduce on the table in this scale. Who knows, I may even enjoy it. 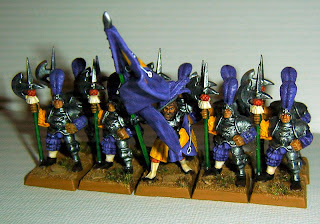 It is after all a venture into a completely new period of gaming for me, up to now, my gaming stopped at 1650 and didn't pick up again until 1939 (I do have an army of Zulu's, but they have no completed opponents, and have yet to go to battle, so I can't count them in gaming terms). I blame a number of factors for this: Having to cover this period in detail on a non-military level three times in the course of my education (school, college and degree - the Industrial revolution every time! 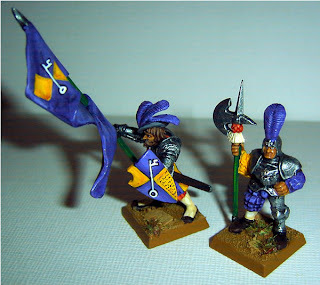 ), the uniforms putting me off back when I was new to painting, and the cost of assembling decent forces in a scale I liked. Since youth I've only really read about the Zulu war in detail, and to a lesser extend the Wars of liberation in South America in this period. Now I will make myself learn at least a bit about the events of 1861 to 1865. And well take it from there, without blinkers. 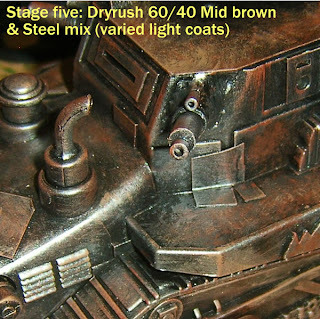 OK so as promised, here is the completed tank from the 'How To'. 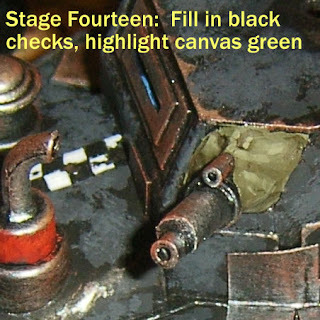 It's a Looted Wagon under the new rules, inspired by the Epic scale Seigfried light tank. 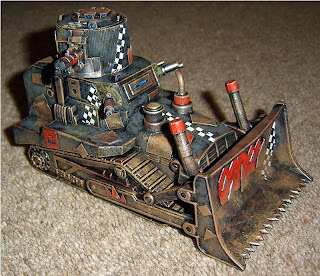 In fairness it's more inspired by the availability of a cheap 'Tonka Toy' bulldozer, which I was able to convert. Painting aside, the most pleasing feature of this vehicle is that it comes with its' own sound effects! 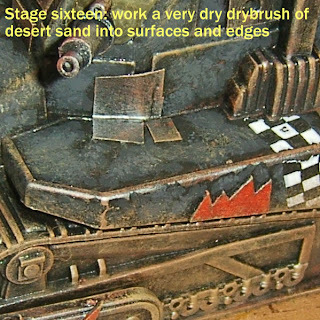 The original toy had a friction motor (ditched) and sound, light and movement effects. 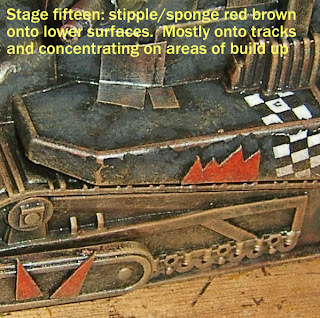 In the build I was able to preserve the sound board, so when you press the cowling on the bonnet the dozer blade lifts up and the horn sounds! Childish fun. The turret came from a bleach bottle in the recycling at home, the flamer barrel was part of a Robogear piece left over from the other builds. The bulldozer itself was a mere £3; money well spent. 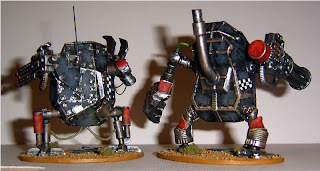 Other than those, the two Killer Kans are also finished. I added more details to the both before beginning to paint them, and following the same basic process as the wagon, these chaps came together in no time at all. Next up for these are the characters, and that'll do for now. I'll have a good 750 points painted, which serve me for the time being. The rest can be tucked away for the winter if needed. So what of the painting totals for the month? Having spent much of the month working on vehicles, the result looks pretty bad, and to be fair it is smaller than I'd have liked. 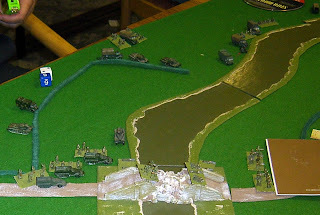 Still a rapid fire battalion of Germans are half finished on the table at the moment, ready for eBay of course. November should start strong, but will finish early. So no better than a 2:1 ratio is likely for the year now, not bad, but my buying habits scuppered doing better. 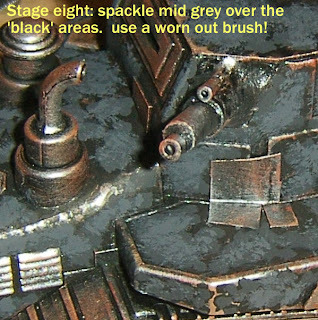 In a rare moment of organisation, I managed to get a shot of every stage in the painting of one of my current models. 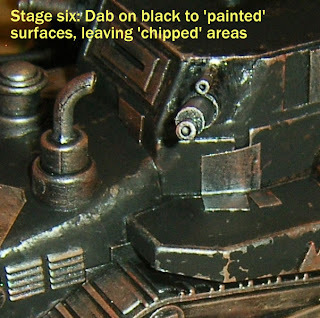 Part of the reason for this is that it represents a honing of my new technique for doing extremely battered looking vehicles. 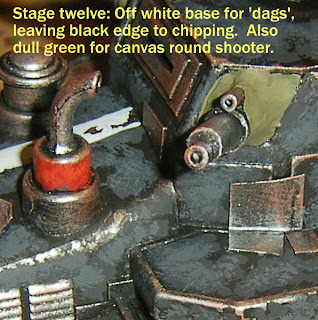 Many of the painting guides will give you a different technique for chipped paint, but I always felt that unless done in very modest amounts it looked very false; This is my solution. 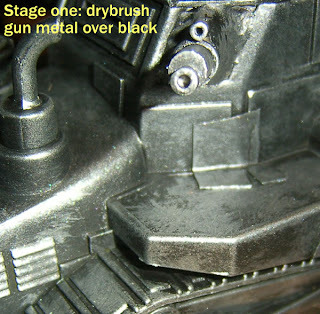 Now when I say weathering, I mean here, really heavy weathering, rust and steel show most everywhere there is an edge on the vehicle and the effect of the paint job is to represent bubbling and blistering paint. This is pretty far from a factory fresh result. 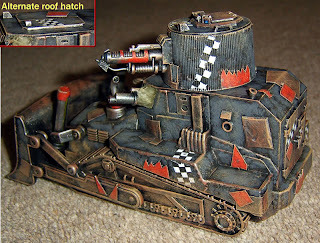 The model in point is one for my Ork army, but don't let that hold you back; the techniques would apply as easily to any well worn historical vehicle, from WW1 to Gulf War2! Where I talk about dags, think of tank numbers and so forth, and it'll soon make sense for any model. 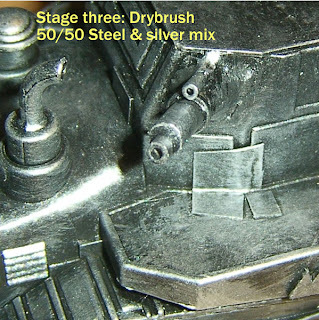 That said, common sense will be needed, before attempting this with 15mm models or smaller!